At the Granada Theatre, Saturday, May 3. Literally years in the making, the return of CAMA’s Los Angeles Philharmonic concerts to the newly renovated Granada stage was easily the most anticipated event of the 2008 concert season thus far, and it more than lived up to some very high expectations. The generous and cultured Santa Barbara audience who made the whole thing possible waited patiently on the sidewalk until just before show time, when the doors were finally flung open for this double occasion. Not only would this be the L.A. Philharmonic’s first performance at the new Granada; it would also be Esa-Pekka Salonen’s last performance in Santa Barbara as the music director of that orchestra, a position he has held for 16 celebrated seasons. 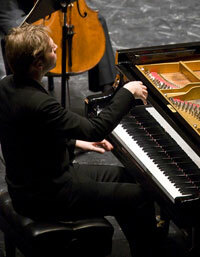 Joining him for this opening/finale were pianist Leif Ove Andsnes and soprano Lisa Gasteen. The program was devoted to just two works, both of them monumental: the Piano Concerto No. 2 in B-Flat Minor, Op. 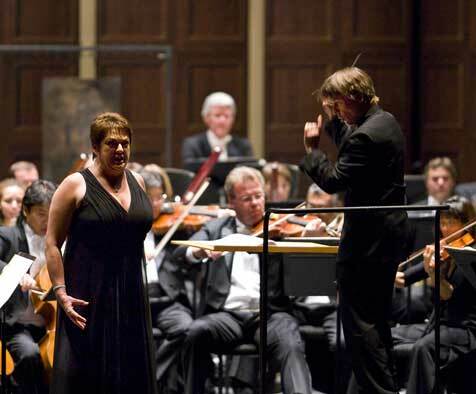 83 of Johannes Brahms, and three selections from Richard Wagner’s opera Gtterd¤mmerung. Leif Ove Andsnes cast a spell with his performance of Brahms's <em>Concerto No. 2</em>. From the opening movement of the Brahms, it was apparent that Andsnes has become a contender for the heavyweight title when it comes to interpreting this composer. The Piano Concerto No. 2 is an enormous work from every perspective, capable of swallowing whole the average symphony within the contours of its multifaceted expressionism. Principal cellist Peter Stumpf shone in the “Andante,” which features some of Brahms’s most gorgeous melodies. Andsnes will reprise the Brahms Concerto No. 2 with Michael Tilson Thomas and the San Francisco Symphony this weekend. It would be amazing to hear him again-he has a light touch, brilliance, clarity, and speed to burn-but why leave home when we finally have it all right here on State Street? The piece, the orchestra, the soloist, the conductor, and the room all came together for an unforgettable experience. Yet in the second half, Salonen showed his considerable savvy as a programmer. The sonic universe of Richard Wagner made a perfect contrast to that of Brahms. Equally absolute in their pursuit of musical perfection, the two composers could not be more different in temperament or tone. By the time Lisa Gasteen made her entrance, the audience was completely won over to this mythopoetic mode and more than happy to be serenaded by a Br¼nnhilde transfixed by Siegfried’s immolation. The Granada is back, and the Los Angeles Philharmonic has shown what majesty there is to look forward to.